I know, I know. We actually hit 100 Days of School ages ago, but I’ve been putting off the “Party” part of it. We’d be skipping it today too, if I didn’t have to turn those particular library books in. 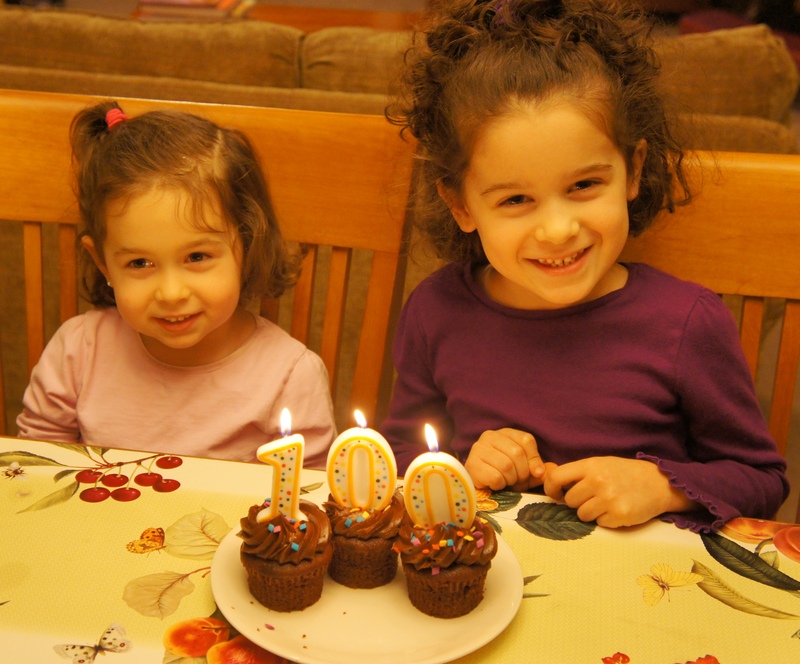 Today I promised the girls we’d do our 100 Days party finally. We ready two books from the library, one of them being Fancy Nancy’s 100 Day of School, since my oldest gets a kick out of that series, and then counted 100 on our 100 chart. We looked for something around the house that we could count to 100. The girls chose their books. Apparently they were able to count to 100 twice and still have more books to go. Yikes! Yes, apparently I’m a book hoarder. I need a 12 step program. We made necklaces out of 100 beads. After doing that, they were getting a bit antsy, so we jumped up and down and counted 100 jumps. 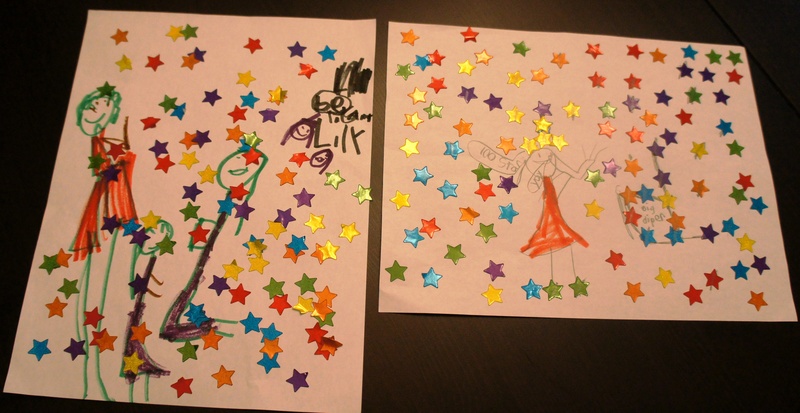 We then made pictures with 100 star stickers. We got out these adorable felt cut-out animals that I bought last year at the HEAV Convention Exhibition Hall (hint, hint – subliminal advertising happening here!) and counted 10 groups of 10. And I’ve been informed that we need brownies to celebrate. Or, the argument was made (I swear one of these girls is going to be a lawyer) that we needed to make 100 desserts. I stuck with brownies today, it seemed a lot easier! Ghiradelli Brownie Mix from Costco, by the way. 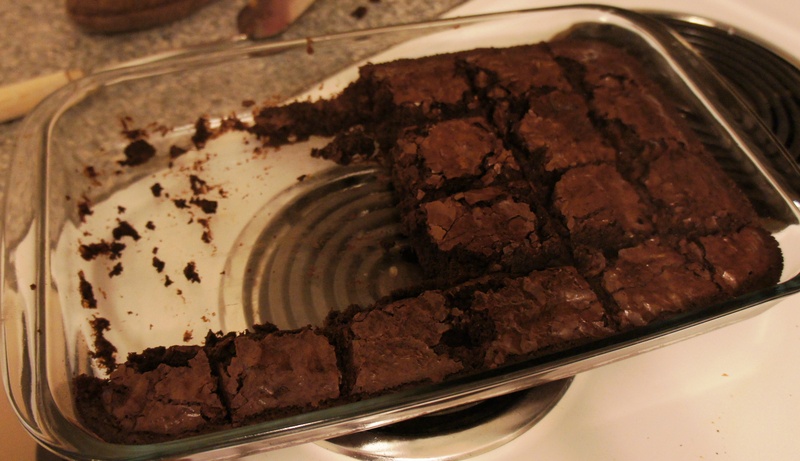 Seriously the best brownies EVER. And now, it seems that we are done with the 100 Days Party in our family, since we’re doing Kindergarten for the last time. Does anyone out there carry it on as a “tradition” after the Kindergarten/First Grade time? I’m curious! We Made It 100 Days! I feel like we have accomplished climbing a huge mountain! Because we have made it through our first 100 days of homeschooling! I have to confess I wasn’t quite prepared, or quite in the mood to do a big huge fancy event day for this. I was under the weather most of the week, and flat burned out. The girls were kind of burned out too – we’ve just moved out of our house and prepping it for a renter and we’re bunking at my parents’ house. My girls are much more enamored of playing nonstop at Papa and Nana’s house, and I’m feeling lazy enough to let them. 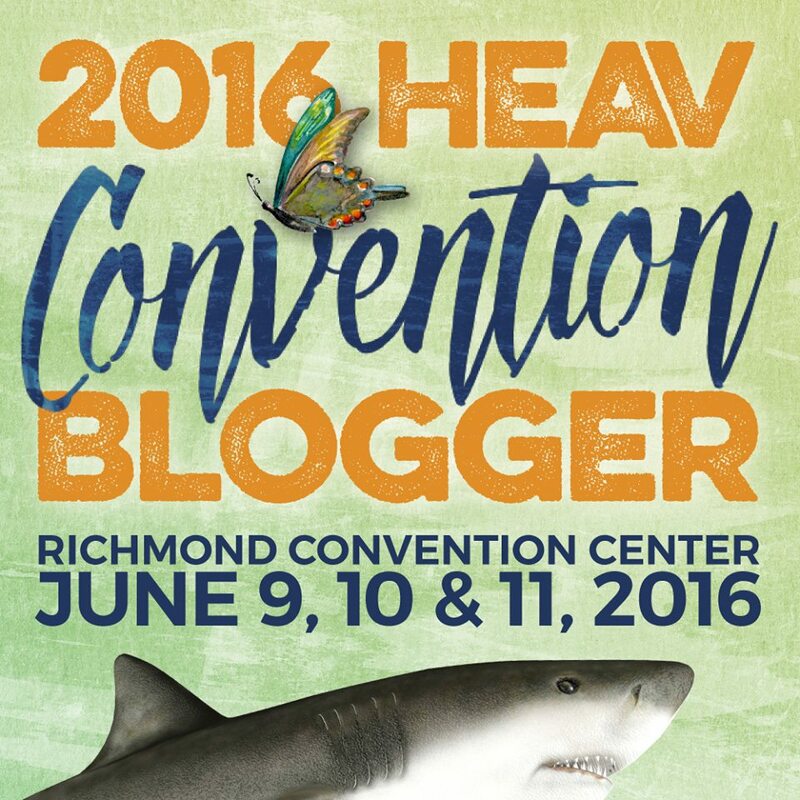 BUT, we needed to get this 100 day party out-of-the-way before our move and long drive. So, we did. 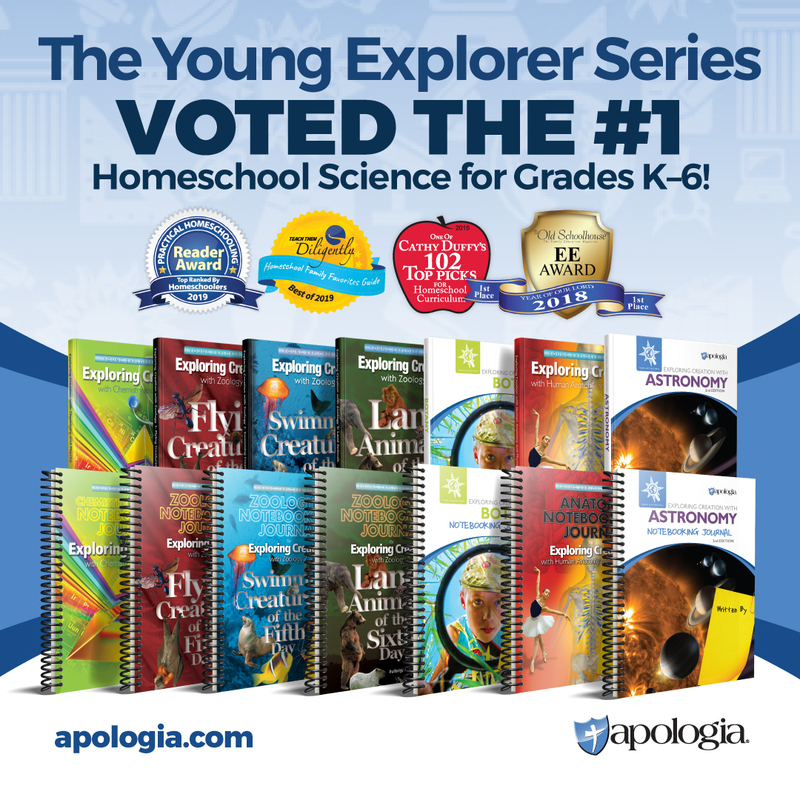 100 Days of Homeschool – Here is another homeschooler’s post about their activities that day. I really wanted to make the hats she shows here, but never did. Count to 100 using our number cards on the wall. Draw a picture of yourself showing what you will look like at 100. Count 100 jelly beans. Sort them by color, and then complete a graph. Line up 100 dominoes and knock them over. Exercise 100 seconds. Complete 10 seconds of each of the following activities: jumping jacks, toe touches, sit-ups, twisting at the waist, running in place, reaching over your head, going up and down the stairs, arm bends, skipping, making a bridge. Stick 100 stickers in a book. Make a design with 100 pattern blocks. Build with 100 soft foam blocks. Put the number tiles 1-100 in order on the 100 chart. Put together a 100 piece puzzle. Bowling! 10 pins for 10 frames=100 (my husband came up with the idea and even took a couple hours off this afternoon and joined us). Score keeping was great math for my 3rd grader also. Made a trail mix with 10 pieces of 10 different things – popcorn, almonds, chocolate chips, raisins, pretzels, etc. – so it has 100 pieces. Before making the mix I had out bowls of different sizes and asked the kids to guess (estimate) which size bowl the mix would fit into. Of course they chose the very large mixing bowl and were surprised that it would fit into a Ziploc bag. Making the number “100” out of play dough. 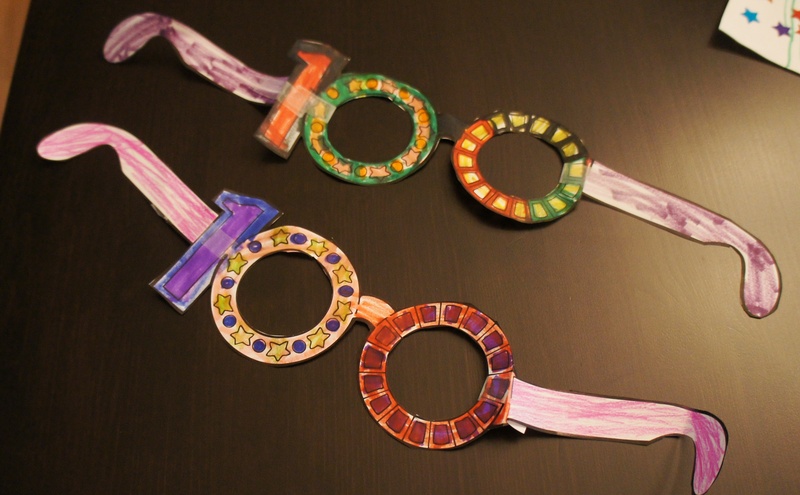 “100th day glasses” – Found the pattern and we made them out of cardstock. It was fun!! We read Miss Kindergarten Celebrates 100 Days of Kindergarten and 100 Days of School. Counted our popsicle sticks by tens (that we’ve been counting all year). We did some stamping with paint – making a design out of 100 stamps. I had my son try to make a “100” out of Legos and started my daughter on a string of beads and Cheerios. Make necklaces with 100 Fruit Loops. Optional: string in groups of 10 by color. Read the story The Wolf’s Chicken Stew. The wolf tries to fatten up the chicken by cooking 100 donuts. 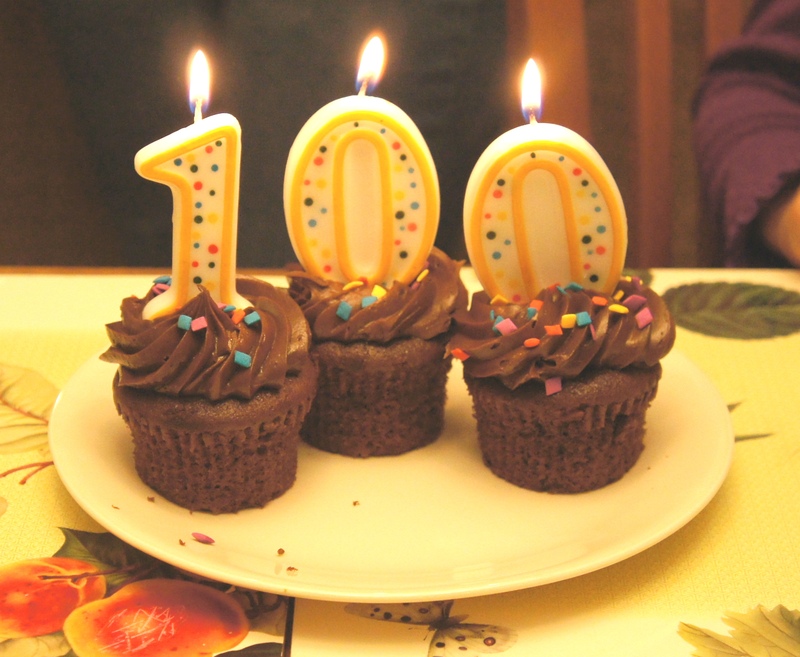 There are other “100” books too – check your library! For Phys. Ed. Do 10 each of: sit-ups, touching the toes, then the shoulders, the waist etc., jumping on both feet, jumping jacks, wiggles all over, hops on one foot, then on the other, bounces of a ball, claps, shrugs. Weighing items of 100: bags of 100 pennies, 100 popsicle sticks, 100 pasta noodles, 100 fruit loops and any other 100 items you can find. Guess which bag of 100 items weighs the most down to the least. Then test your guesses by weighing them and then chart them. Put together 100 piece puzzles. Use an individual hundred counting charts. 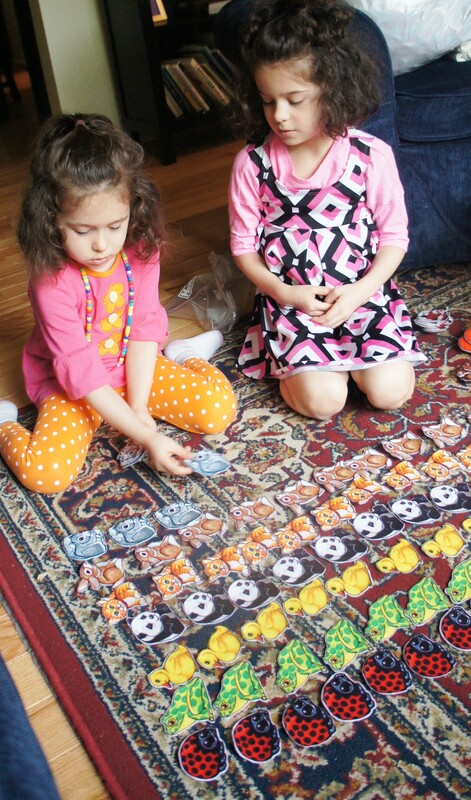 Using a commercial die, each child takes turns throwing the die and coloring their chart the same number as is shown on the die for their turn e.g. roll 5, color the first 5 squares, next turn, roll 3, color next 3 squares etc. The first child to get to 100, filling the entire grid is the winner. Have 100 squares pre-cut. Use to make a picture. I used a square whale of a punch and different colored cardstock. The pictures turned out great! Students draw a picture of how they will look when they are 100 years old. This is definitely a keeper! Give students 100 pennies and take them to the dollar store to let them buy something. I thought it would be a good segway into money. Decorating a hollow “100” that I printed on a piece of cardstock with 100 stickers. Happy Hundred dance — free form, no music, just a lot of wiggling. Made a 100 out of our bodies — stand like a soldier with arms by our side for “1” then touch toes with back arched for each zero. Measured 100 of Daddy’s steps, Measured 100 of student steps, many races, Hopscotch by 5’s. For us, the 100 Days is hitting the same weekend as Mardi Gras and Valentine’s Day, so we kept it low-key. We also spread the activities out over the whole weekend, due to my girls’ short attention span right now. And I just realized that all of our activities were sweet-related! Ooops! Oh well, they’re a good bribe sometimes! Before starting our fun, I made our oldest count to 100 using her chart, because that’s the only way a 100 party can start! 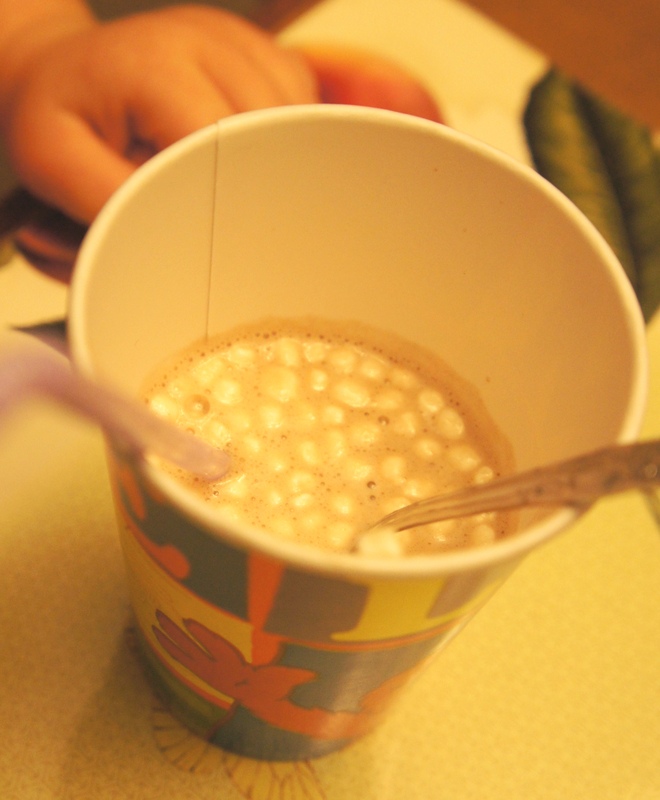 We also counted 100 mini marshmallows for our hot chocolate! Big sister counted for both of them, so she actually counted to 100 twice. 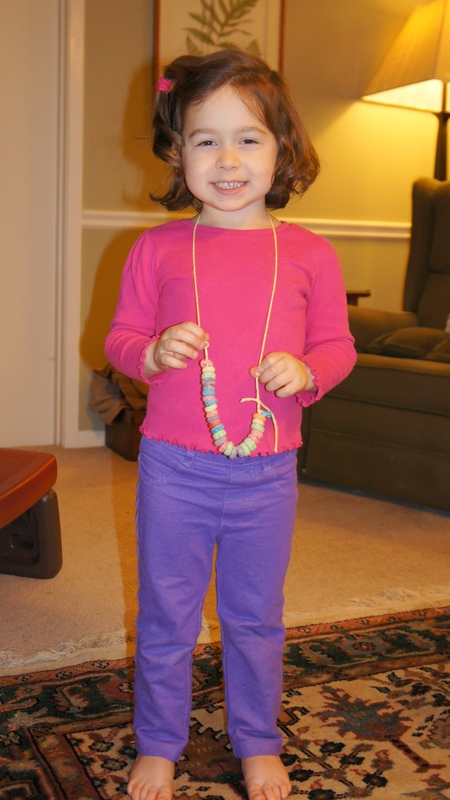 We made fruit loop necklaces out of 100 fruit loops!